This series chronicles sweet experiences recounted by the devotees of HH Maharanyam Sri Sri Muralidhara Swamiji as well as some divine experiences of Sri Swamiji himself. These articles are translations from the series, “Madhuramaana Mahaneeyar” that is published every month in Madhuramurali Tamil monthly magazine. Deity images for worship are made using stone, metals, mortar and other materials. Then bimba shuddhi and other cleansing rites are then done and praana prathista (invoking God in the deity) is performed. Then a grand samprokshanam (deity installation) is done. Even after this, only with the continuous performance of prescribed rituals, poojas, utsavams, anna dhaanam and with the presence of heartfelt worshippers will the saanidhyam, i.e. divinity, in the images increase; or remain without decreasing. In many temples there is sometimes a sudden increase or a decrease in the crowds of devotees who visit the temple. 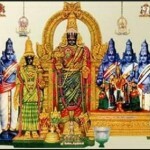 The reason for this is a change in the saanidhyam of the image in the temple. However, some images acquire saanidhyam as soon as they are made or begun to be made, without any praana prathishta. We cannot fathom the reason behind this. The only reason could be that perhaps the Lord Himself decides, of His own accord, to enter these images. 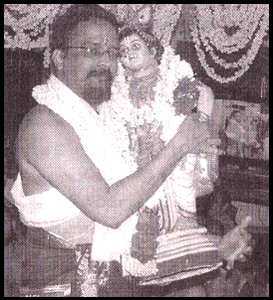 Many years ago, Sri Swamiji had once visited the Parthasarathy temple in Triplicane, Chennai. After having darshan, when Sri Swamiji came outside, he saw a number of Krishna vigrahams (statues) made of papier mache displayed for sale outside a shop. Sri Swamiji glanced at those images and left. That night he had a vision. In that vision, Lord Sri Krishna appeared in one of the images that Sri Swamiji had seen in the shop outside the Parthasarathy temple. He said, “I want to come and be with you. I will wait for you tomorrow,” and disappeared. As soon as the next morning dawned, the first thing that Sri Swamiji did was to go to that shop. He waited there till it opened and then brought the Krishna back with him. 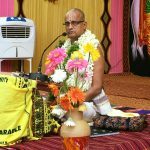 Since that time, until now, this Krishna has enjoyed thousands of Divya Nama sankirtanams, and continues to do so even today. It is indeed amazing that jnanis and mahans can very clearly perceive Bhagavan’s sannidhyam when it is present in a particular place.